The forecast for Death Valley in California called for 128, but it was a few degrees shy of that, according to unofficial reports from the National Weather Service. Death Valley's record high of 134, set a century ago, stands as the highest temperature ever recorded on Earth. Phoenix hit 119 by mid-afternoon, breaking the record for June 29 that was set in 1994. The 2 day Saturday Sunday forecast is put up in map form:City forecast below. Mumbai: Saturday will be cloudy with some showers in different parts of City. Gusty winds from SW at 30 kmph, with more showers by evening/night,. Rain Amounts will be 25-30 mms average. Sunday will be more cloudy with rain frequency increasing. Heavy showers expected by late afternoon or evening. Rain Amount for city and suburbs 30-35 mms avg. Delhi NCR: Saturday/Sunday:Partly cloudy with thundery developments in vicinity. Some drifting in Eastern parts possible. Day will be around 37c. Heavy showers expected on Monday night into Early Tuesday.Rain Amount will be given later as the conditions develop, but could be in excess of 45 mms. Chennai: Warm and stuffy, with chance of showers in some areas on Sunday night. Kolkata: Good chances of Thunder Showers on Saurday evening/Night, with precipitation amounting to 25 mms. Sunday will see a decrease with rain in some areas. Lucknow will get heavy rains this weekend. Rainfall may be > 100 mms on Saturday/Sunday. Kanpur will too be lashed by Heavy rains. Bhutan can recieve very heavy rainfall on Saturday. 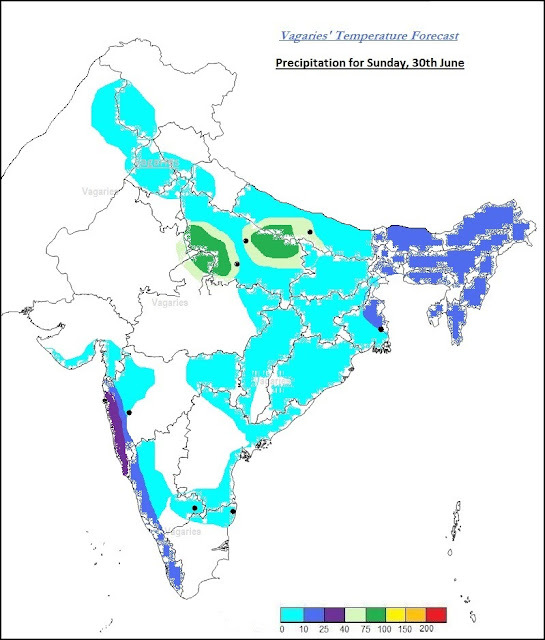 Similarly, Heavy rains are expected along the lower plains of Nepal on Saturday and Sunday. Kathmandu can get thunder showers on both the days, amounting to 20-25 mms. Saturday/Sunday: Northern Pakistan, North of Punjab will get some rain showers. Nawabshah, Sukkur will be around 42c, Sindh and Central regions will be dry and hot. We see temperatures touching 48c in Nokkundi.Sindh will need to wait for a few days more for meaningful rains, as even the rains in the North decrease early next week. This Year , as on 27th June, (IMD takes last Wednesday as the June %), All India SWM surplus by +38%. On record, we have only 4 years ( prior to 2013) with SWM surplus over 38% (June End) in the last 113 years ! The SWM performance Map of 2013, as on 27th June, shows most regions in surplus or excess. Rarely do we see such a superb performance map ! Uttrakhand Surplus by +231% ! But it should be remembered that the premature arrival of the Monsoon in a major part of NW and Northern India added to the surplus rains. Charts will be put up showing the actual June end position by 3rd July. Due to non availability of reservation, Vagaries' Sunday meeting will be held in South Mumbai. Meeting scheduled for Atria Mall, Worli on Sunday 30th ,at 5 pm ...Thanks and please make it convenient to attend. Cmdr Potey: Akola details in Lokmay, Page 3.. I guess even 2001 June was almost +35 % , year ended up with appx - 9 % deficit. Thanks Cmdr Potey> Always to help the farmers..every Monday and Friday in Lokmat..
Rajesh sir , what i am saying is it ,Looks like the heavy rains trend will continue in July too, along the west coast. sam: West coast generally remains wet in varying degrees. Depending on the waxing and waning of the off shore trough. Rajeshbhai, hope you can elaborate more in some future post on how the waxing and waning of off shore trough happens and how a vortex forms. We are having a spell of clear weather with bouts of intense rains and sunshine, averaging between 10-40 mm in different parts of Goa. thre's been a lot of articles reg jamstec's forecasts of an iod. the australian BOM also is forecasting the same. last year that was one of the reasons for poor rains in july and august i believe. 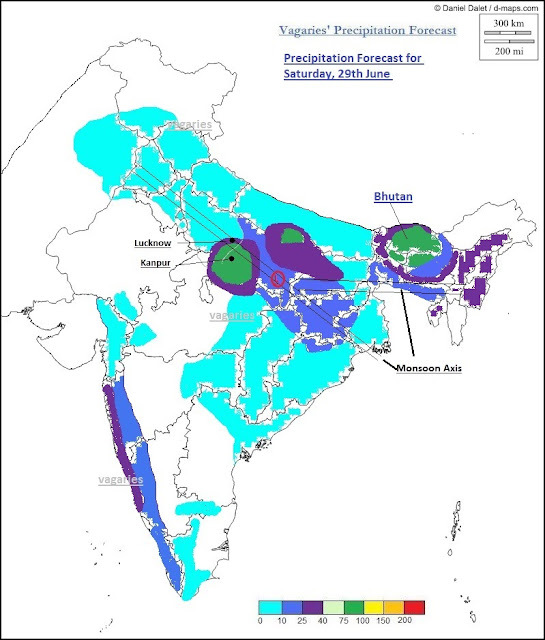 could you throw some light on the prospects of rains this year in july? 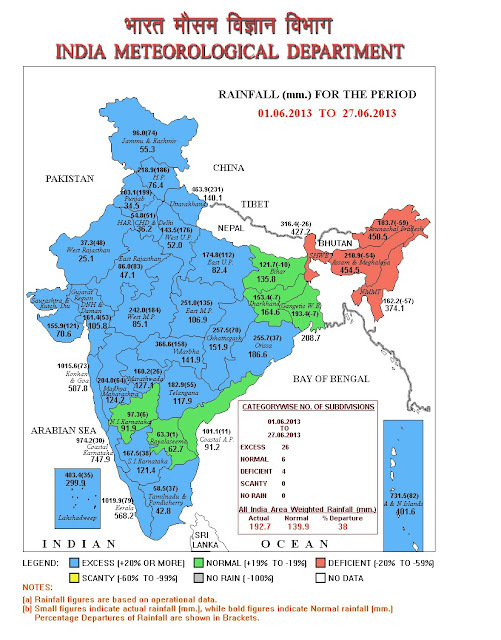 Mumbai SCZ ..June 2013 rainfall( 1-30 Jun till 8.30 am): 102.98 cms [New monthly rainfall record for Jun as per IMD Mumbai archives.. ,.. Second highest rainfall record for Jun as per IMD extreme info ] ..
From chennai : June has been a blessing in disguise as Chennai southern suburbs near the Airpot have been getting rains consistently. Alsmost on evenings everyday we could see grey clouds hovering all over the place. Jay: anyway i do not rely too much on IOD, it is comparitively a new concept, not proven. End of next week looks wet for Mumbai, things will be clear by thursday night.